Simple and elegant! 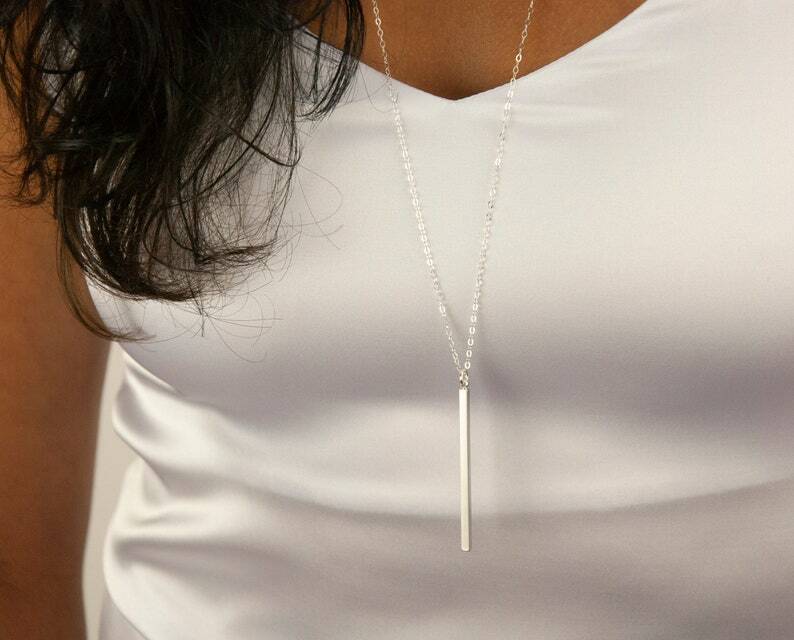 The long silver bar necklace features a dainty matt rhodium-plated bar pendant on a dainty long chain. It is a very versatile piece that can be worn on its own or as a piece for layering. ► Photo 2: Medium sized model - length 28"
► Photo 3: Small sized model - length 28"
Bar pendant: Matt rhodium plated measuring approximately 1 7/8" to 2 " long x 1/8" wide (approx. 48 mm to 50 mm long" x 3 mm wide). Cable chain: High quality .925 sterling silver cable chain and components. Easy to open spring clasp. LENGTH = chain measured open end-to-end + the hanging bar pendant. ►For necklaces that are 28 inches and over, no clasp will be attached. If you would like a clasp added, please specify this in the "note to seller" at checkout, otherwise the default will be no clasp. Comes in a cute gift box ready for gift giving. Beautiful item! Was shipped super fast! Thrilled all the way around. Looks great as pictured in photo. The necklace was lovely. It was nicely packaged and the service was fabulous. I will continue to watch this shop. Thank you so much.